The credit card business naturally lends itself to good investor returns over most time periods. But we can bank 50% to 100% gains per year by purchasing when dividend growth is high but a stock is cheap due to headline worries. Investors have caught on to the fact that Visa (V) and Mastercard (MA) – which returned 770% and 758% over the last decade, and increased their dividends more than ten-fold – are excellent businesses. Both trade for more than 35-times their yearly earnings today, and yield only 0.5%. But they haven’t yet uncovered Synchrony Financial (SYF). It’s one of the cheapest card stocks in the deck. And it might also be the best. Synchrony was founded in 2003, but operated as a subsidiary of GE Capital until its 2014 spinoff and subsequent IPO (initial public offering). Its offerings help its business customers connect directly with their own customers – an absolute must in an age where purchase preferences change by the hour. This “new kid” is still on sale today thanks to its limited track record as a standalone entity. It was further discounted last week when a longtime customer told Synchrony it’d have to keep singing for its supper. We should take advantage of the overreaction and “buy the dip.” Don’t be fooled by the stock’s modest 1.9% yield. With a dividend rolling 40% higher year-over-year, this stock is setup for 51% potential gains (which I’ll break down for you in step three of our “how to make 51% next year” tutorial). Investors are not quite sure what to make of the “new kid” – plus they worry about rumors that Walmart is weighing a bid from Capital One. I expect Synchrony will bounce back sooner and swifter. You see, the company provides an important “loyalty lifeline” service for retailers who (as you probably know) need all the help they can muster these days. Retail used to be a competitive-enough business when stores “only” competed with other physical stores within driving distance. Consumers had to hop in their cars and drive somewhere else in order to shop around. Today, Amazon.com (AMZN) and the broader Internet have made shopping around much easier. Two-day, one-day and even same-day shipping make it less appealing to drive somewhere and wait in line. Which means the retailers who want to survive and thrive today must “step up their games” and connect directly with their customers (instead of sitting back and waiting for them to walk into their store). Loyalty programs and one-stop shop financing plans are “must haves” for retailers today. And Synchrony provides the cards that power these platforms. Meanwhile Synchrony’s newer Payment Solutions and CareCredit programs focus on “big-ticket” items that can be more easily purchased in monthly installments. These cards help customers buy a new couch, television or set of eyeglasses now and pay for it over time without penalties and higher interest or dents in their credit ratings. Nissan, Jiffy Lube and Rite Aid have recently signed up with Synchrony. These new partners help create more active accounts, which in turn generate more interest and fees for the loans that Synchrony extends their customers. Year-over-year the firm has boosted its active accounts by 5% while collecting an additional 12% in interest and fees versus the same quarter a year earlier. Today the company is already a cash cow, capable of returning a generous portion of its profits to shareholders. But it’s the growth potential that makes this play particularly exciting – especially since it seems to be flying under the radar for now. Today’s dividends are cash in our pocket. 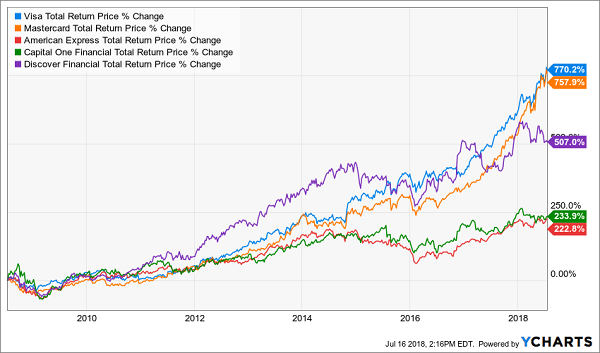 Meanwhile share repurchases often kick off a “virtuous cycle” that makes our shares more and more valuable (with less shares available, everything looks better – including profits and dividends – on a per share basis). And tomorrow’s dividend hikes are also underappreciated. 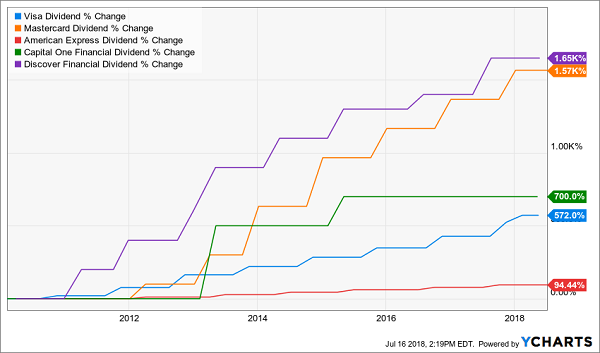 Stock prices tend to rise along with their payouts, which is why your favorite dividend aristocrat always seems to “only” pay 3% even though it hikes its dividend every year (its price is likely rising just as fast). Since its spinoff in 2014, Synchrony has paid a regular dividend and repurchased shares. But it’s now beginning to turn up the volume on its own “shareholder rewards” program – which makes right now the ideal time to buy shares of our own. 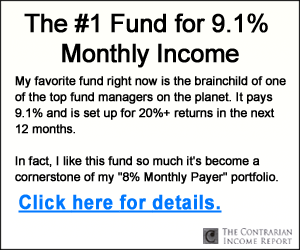 In fact, at the Morgan Stanley Financials Conference last month, Synchrony’s Chief Financial Officer (CFO) Brian Doubles admitted the company had a “problem” – it has too much capital! Here’s how he’s “fixing” this issue by dishing cash to investors. As discussed, the stock pays 1.9% today. Its recent 40% dividend hike is a whiff of dividend grapeshot that should be taken seriously. 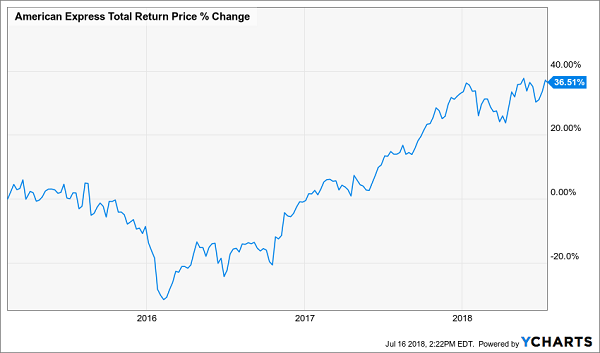 With a modest 22% payout ratio (the dividend’s percentage of profits) there is plenty of room for double-digit dividend growth into the foreseeable future. Buybacks are ramping up, too. Synchrony started buying back its stock in the second half of 2016. Recently the company announced a buyback plan for $2.2 billion over the next twelve months – about 9% of its current float! When we add up Synchrony’s forward yield (1.8%), its buybacks (9% yearly) and its dividend growth (40%), we have formula for 51% total returns over the next twelve months. Our cover won’t last forever, so let’s buy our stake now before the market wakes up to Synchrony’s sweet business model and economics. After all, these 40% dividend hikes don’t usually go unnoticed for long. Which future aristocrats should you buy today? 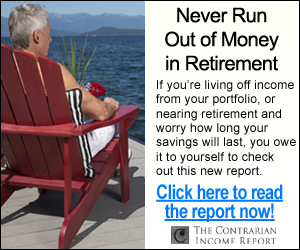 Well you know me – I’ve got three best buys – plus four more bonus dividend growth stocks – that should safely double your money every three to five years. If you achieve returns of 23.7%, you’ll double your money every three years. So if you haven’t been following this strategy, why not? The best time to get started is right now – before the seven dividend growers I mentioned begin to move. Click here and I’ll share their names, tickers and buy prices with you right now.